Graphic Packaging's IntegraFlex packaging is comprised of two distinctly different paper-based substrates to create a collapsible cup package: a paper liner and paperboard cup. 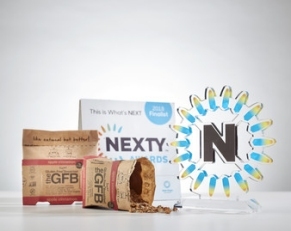 April 10, 2018 - The Gluten Free Bar (GFB) Power Breakfast recently won the NEXTY Award for Best New Packaging Innovation during Natural Products Expo West. IntegraFlexTM, the collapsible cup packaging technology, is a solution developed by Graphic Packaging International (GPI). The award recognizes the most innovative products in the natural products industry. "The GFB is all about making good-for-you, gluten-free food, in good-for-you ways," said Elliott Rader, Owner/Partner at The GFB. "This packaging allows us to deliver our food in an innovative manner and, considering the package is partially recyclable, it delivers on the "good-for-you ways" part of our brand promise. “We try to bring innovative products to the market that communicate quality, convenience and taste. GPI's IntegraFlex packaging speaks to quality and most certainly convenience, and once a consumer tries the product, they'll realize that we are delivering on great taste as well." Kelly Fitzwater, new product development manager at GPI, explained, “IntegraFlex is comprised of two distinctly different paper-based substrates to create a collapsible cup package: a paper liner and paperboard cup. The ability to mix and match substrates allowed us to create a package that reinforces the healthy natural look that Gluten Free Bar was seeking. The slim space-saving design makes it a snap to take a convenient snack or meal on the go." Chuck Tarlton, director of business development at GPI, noted, "Oatmeal is an ideal product for IntegraFlex. This is an example of the right product combined with the right packaging that simultaneously drives value for the brand and the consumer." The technology allows for the product to ship flat, making distribution a little simpler. It also demonstrates several consumer benefits. To use, the consumer tears open the top of the liner, erects the collapsible cup by pressing the two sides together, adds liquid to cook, then enjoys right out of the package. The compact solution is portable and can be easily tossed in a bag to go camping or to work, and it can be easily dispensed from a vending machine. Graphic Packaging's IntegraFlex collapsible cup also won the Paperboard Packaging Council's 2017 Innovation of the Year award. Graphic Packaging International, Inc., a subsidiary of Graphic Packaging Holding Company (NYSE: GPK), headquartered in Atlanta, Georgia, is a leading provider of packaging solutions for a wide variety of products to food, beverage and other consumer products companies. The Company is one of the largest producers of folding cartons and holds a leading market position in coated-unbleached kraft and coated-recycled board. To learn more about Graphic Packaging, please visit: www.graphicpkg.com.